Chicken stock, more than any other stock, is the workhorse of the home kitchen. Closely resembling what home cooks would consider broth, it can be employed in an infinite number of dishes. Because it can be difficult to obtain chicken bones, we used chicken wings and bone-in thighs to give our stock body and flavor. You can hold onto leftover raw or cooked chicken bones or carcasses and then freeze them - to use later in making this flavorful stock. Place chicken thighs, wings, onions, carrots, celery, parsley, thyme, bay leaves, and peppercorns in an 8-qt. stockpot. Add cold water to cover contents by 1 inch. Simmer stock over medium heat, skimming fatfrom surface every 30–45 minutes during the first 2 hours. 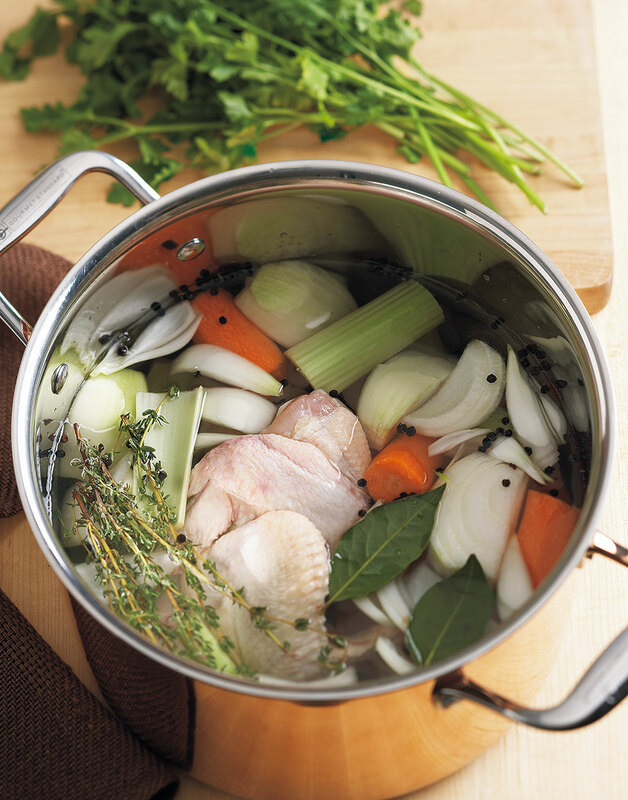 Simmer stock a total of 5–6 hours, adding more cold water as needed to cover ingredients. Using a fine mesh sieve, strain stock into a bowl; discard chicken, bones, and vegetables. In an ice bath, cool bowl of stock to below 40°. Cover stock with plastic wrap and refrigerate. We used bone-in chicken thighs and wings in our stock. Purchase full chicken wings rather than wing tips.